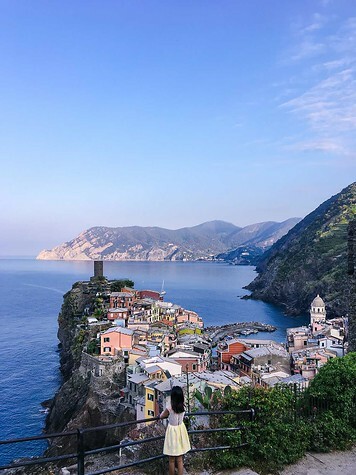 Cinque Terre is one of those places that’s talked about so frequently you can’t help but question if the hype is deserved. 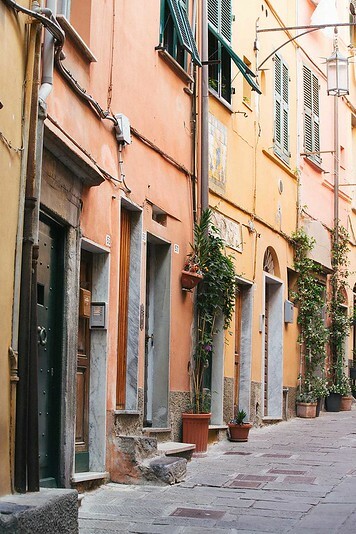 I first visited the picturesque five villages on a day trip during a family tour of Italy. 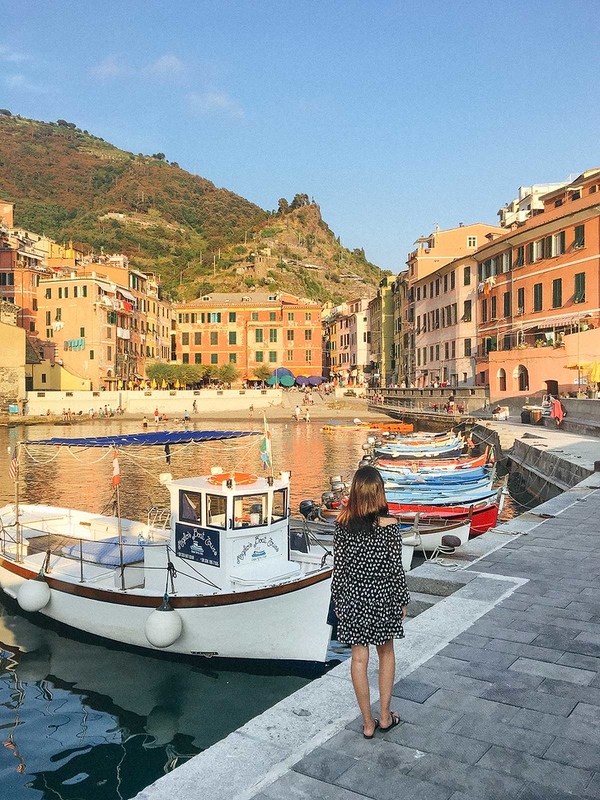 We only had time for a day stopover and visited Portovenere and Monterosso. That quick visit was so beautiful and so unique that I knew I had to double back to re-visit! 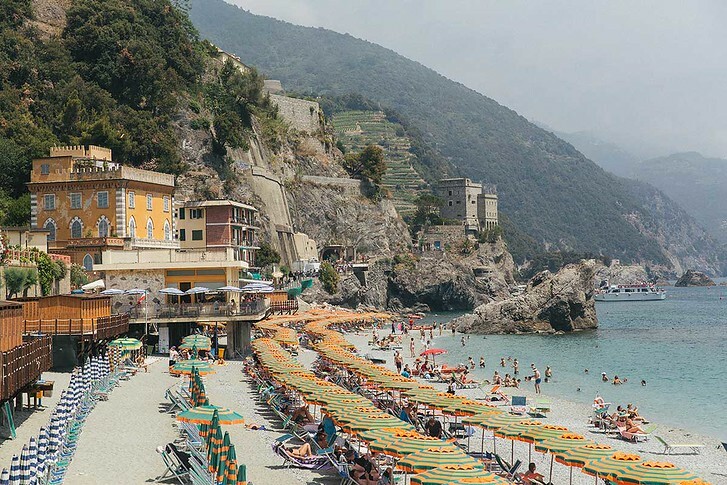 I quickly booked a local hotel for 3 nights and settled in to explore each of Cinque Terre’s towns properly. 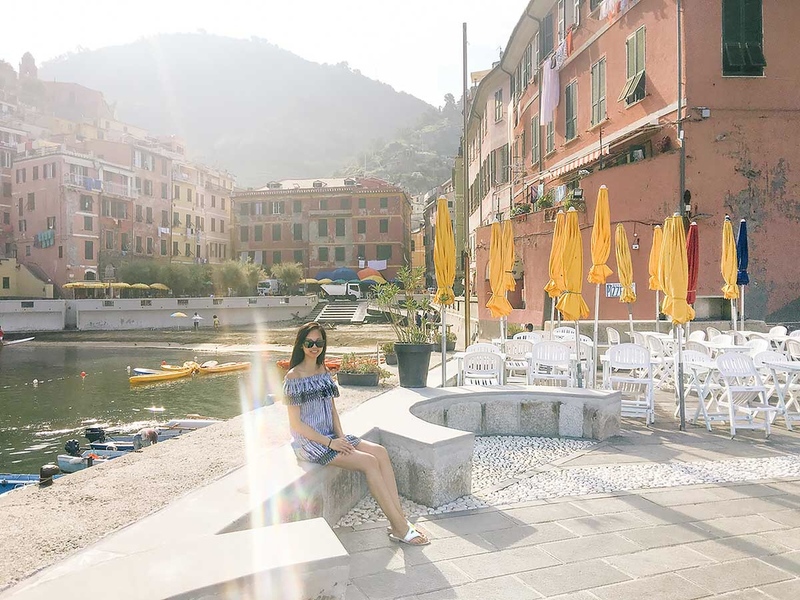 Here’s a photo diary from my visit to Cinque Terre, with photos from each town! 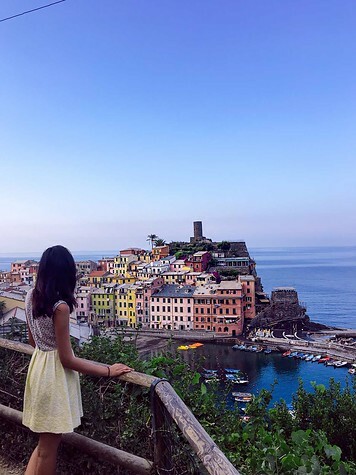 For picture perfect views, I recommend staying in either Vernazza or Monterosso. 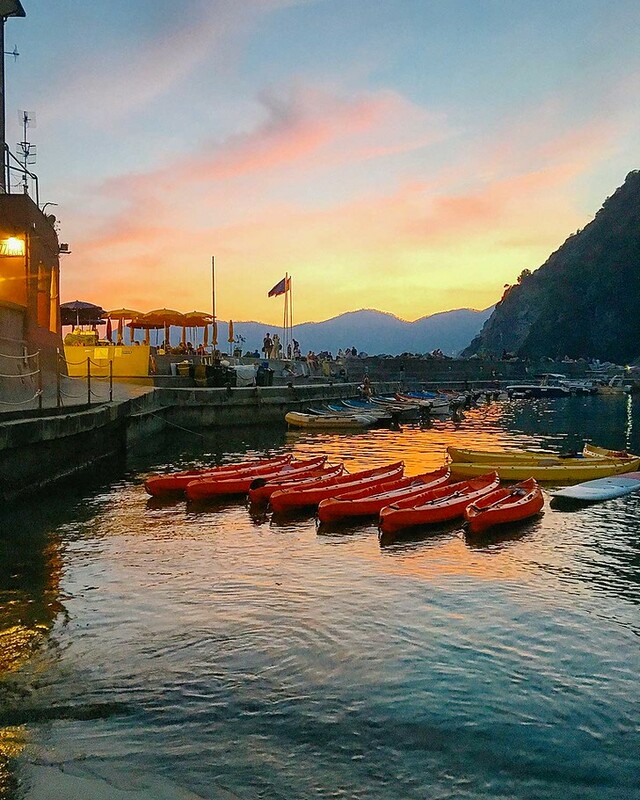 Vernazza is smaller and more picturesque, with some great restaurant options on the harbor. 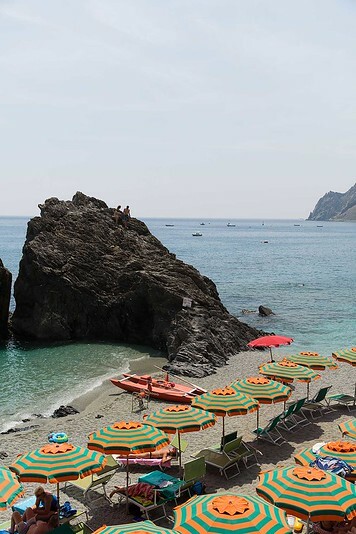 Monterosso is larger and has even more restaurants, with a focus on fresh seafood places as well as lots of lodging options. 1. 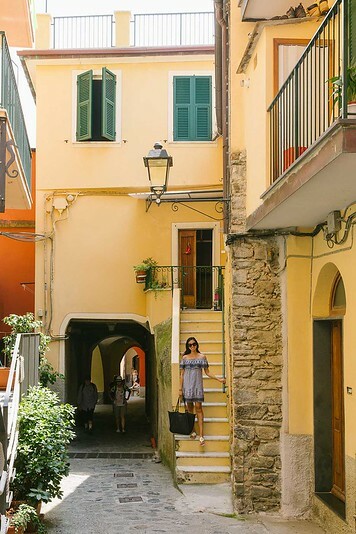 Santa Marta in Vernazza has recently renovated rooms with air conditioning (a rarity in Cinque Terre!). 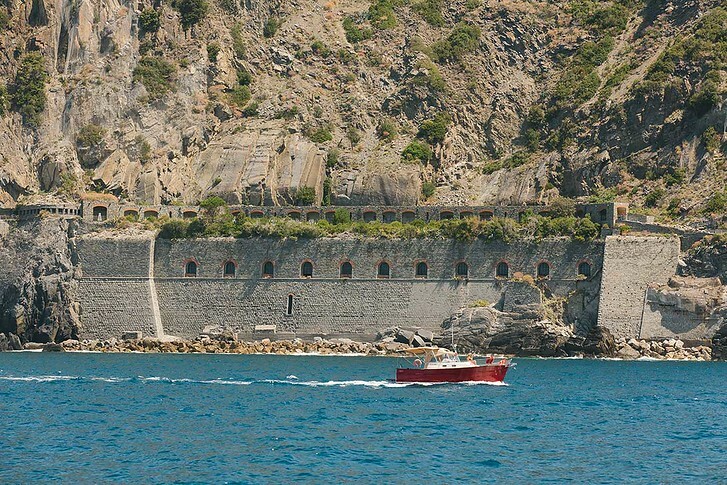 Private bathrooms, in-room TVs and comfortable, clean rooms make this one of the better new options in Vernazza. 2. 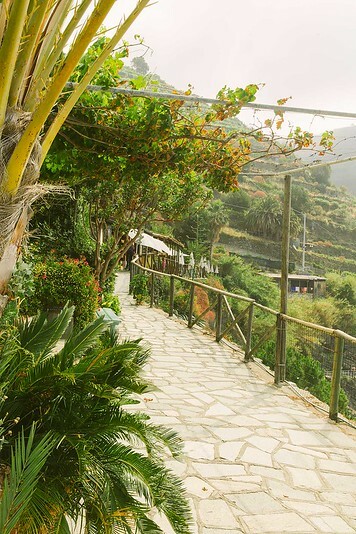 Hotel Palme is a lush, secluded property on Monterosso’s hill with a beautiful view and short walk to the beach. 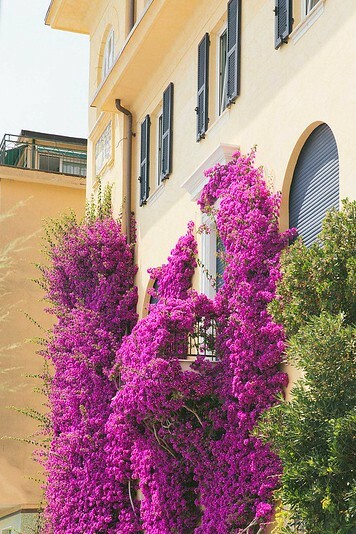 Rooms are clean and light filled, some come with balconies. 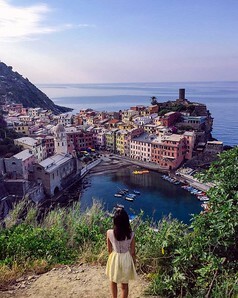 Vernazza is where I chose to make my home basis. 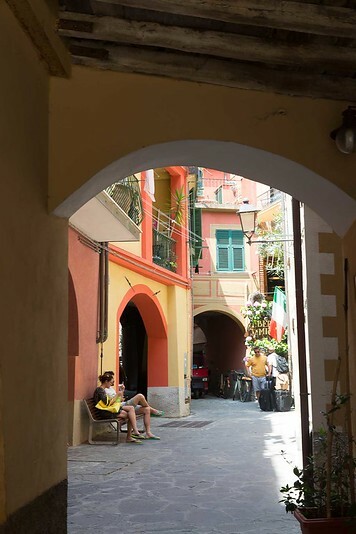 It’s frequently described as the Goldilocks ‘just right’ town in Cinque Terre, not to big, not to small and perfectly quaint. Due to a delay, I didn’t make it into town until quite late in the day around 8pm. I checked in, dropped off my bags and quickly sat down for dinner before the restaurants closed. The next morning, I woke up bright and early to hit the trails. I came prepared with my Rick Steves Italy guide book and he recommended two *amazing* viewpoints in particular. 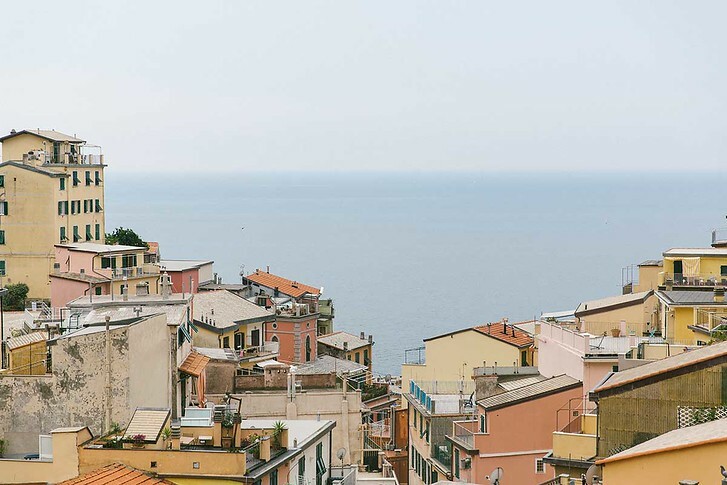 First, I headed southeast towards Corniglia and saw the back-to-front view of Vernazza. 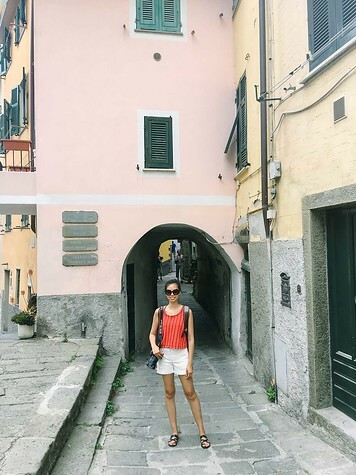 A couple hundred photos later, I turned back into town to hike the path from Vernazza to Monterosso. This is frequently described as a difficult, uphill 2 hour walk and boy, it sure was more challenging than I thought it would be! I passed lots of hikers with walking poles. After some more picture perfect views, I decided I had had enough and headed back into town for a proper breakfast/lunch. 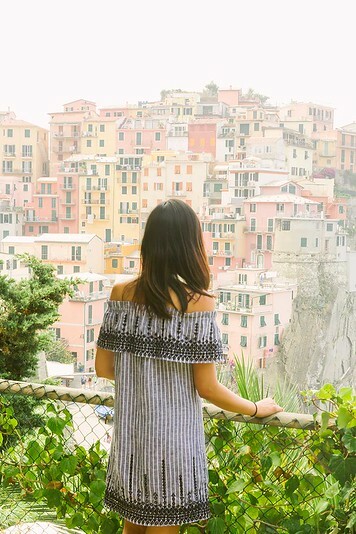 I grabbed a healthy, delicious lunch to go and took the train into Riomaggiore for some more sightseeing. After a couple hours of walking and some beach time, I took a quick siesta, Italian style. I ended up grabbing a delicious pasta dinner and people watching on the waterfront. 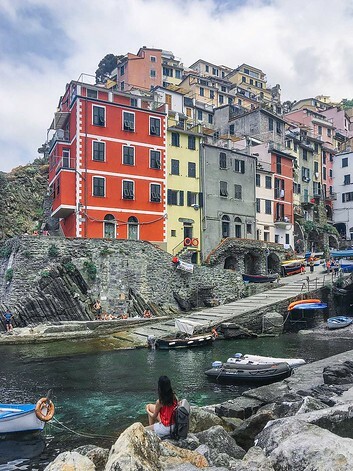 Riomaggiore is one of the prettiest towns from the waterfront, because large distinctive buildings dominate the small harbour. I was really excited to explore this town! 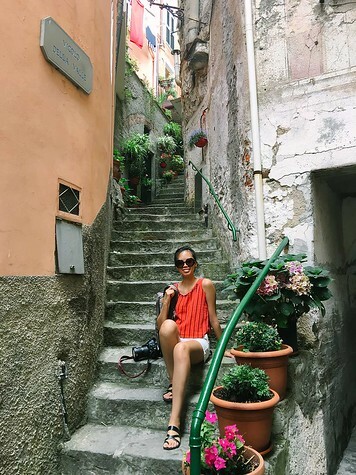 When I stepped off the train platform, I followed the crowd through a long tunnel, and emerged into Old Town Riomaggiore. There’s a large viewing platform where I lingered for a bit, before heading up to the hills to discover the back streets. 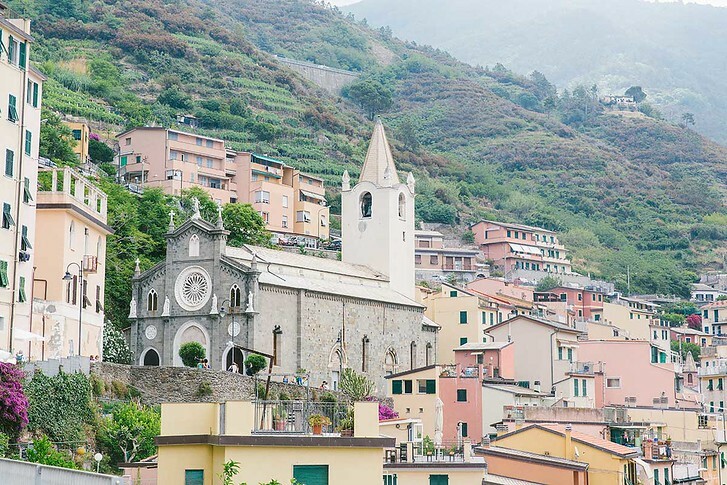 Riomaggiore has a pretty church that overlooks the town. If you keep walking, you can walk along the cliff’s edges. I actually saw that the pathway was partially blocked but thought it was just debris and kept walking. Nope! They tried to warn people that part of the cliff walk was blown away into the sea. After a bit of a thrill, I re-traced my steps, found the main path and kept walking back down to the harbor. The entire walking loop took about 2 hours and was quite leisurely. 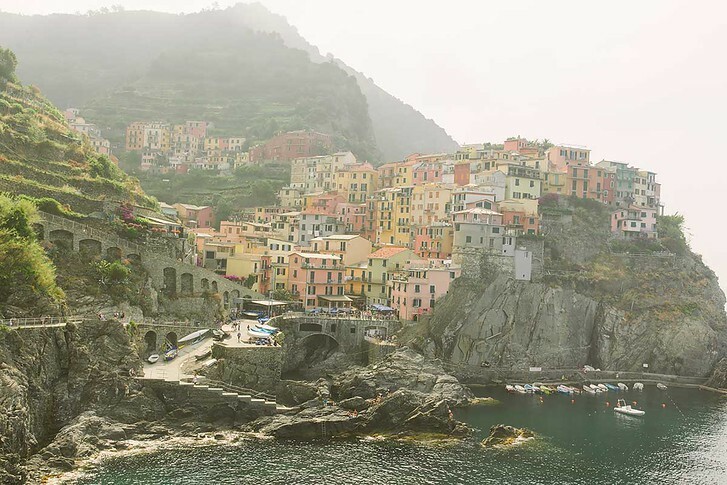 Manarola is very pastel and very picturesque! There’s a wide pathway that loops around the cliffs and is breathtaking – you have to walk here! The nice thing about it is its all paved and completely flat so for non hikers who still want some epic photos, this is the spot! The path loops around Manarola’s new town, with a small playground, cemetery and popular restaurant. Make sure to check back over your shoulder so you don’t miss anything! I found that the farther I walked, the view just kept getting better and better. 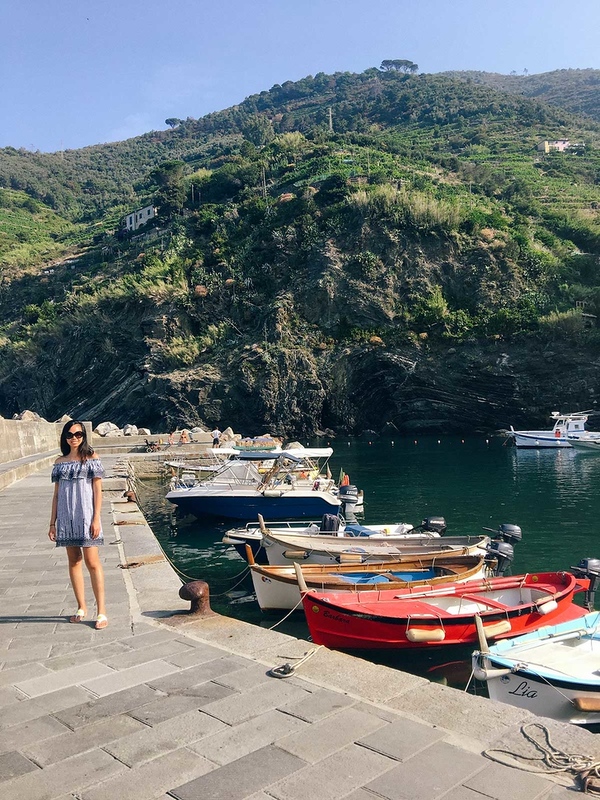 Monterosso is known for its beaches so on my last day, I decided to have a casual day in the sea. The largest stretch of the beach is in New Town, opposite the train station. I grabbed a delicious pesto pasta lunch and set out to find a cabana to call my own. 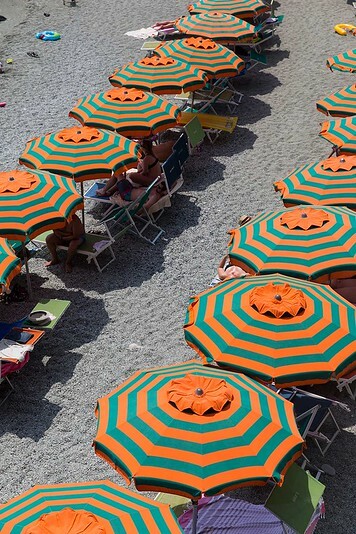 The colorful striped umbrellas are for rent whereas the open sandy areas are free for public access. The beach was surprisingly rocky! I was expecting soft sand but it’s not like that at all. In the end, I skipped a long day at the beach in favor of ice cream and more pasta. 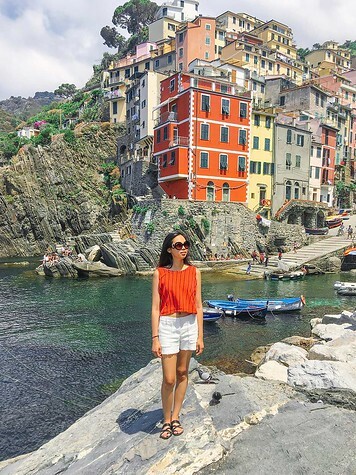 The first time I visited Cinque Terre was as a day trip from Santa Margherita Ligure. 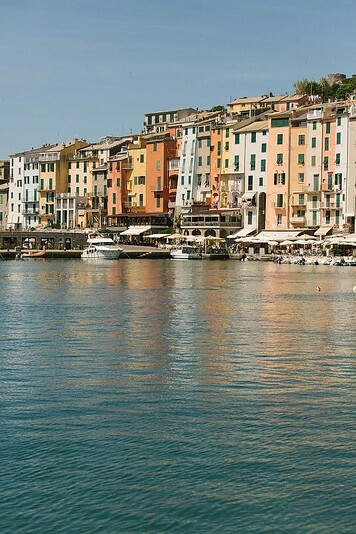 Santa Margherita makes an affordable, convenient base for visiting all the pretty fishing villages on the Ligurian coast, as it’s a short 15 minute drive from glitzy Portofino and about a 30 minute train ride from Monterosso. 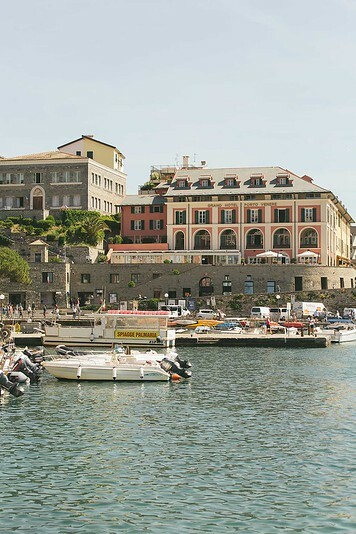 We caught a boat from La Spezia and stopped first at Portovenere. 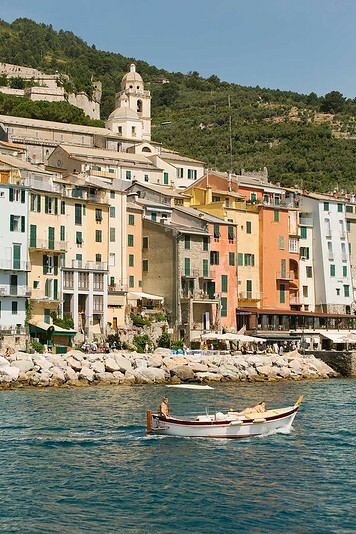 The main waterfront sits right on the harbor and each pastel house bleeds prettily into the waves. After disembarking, we headed up the steps into the narrow Old Town. There’s really just one main street through town. 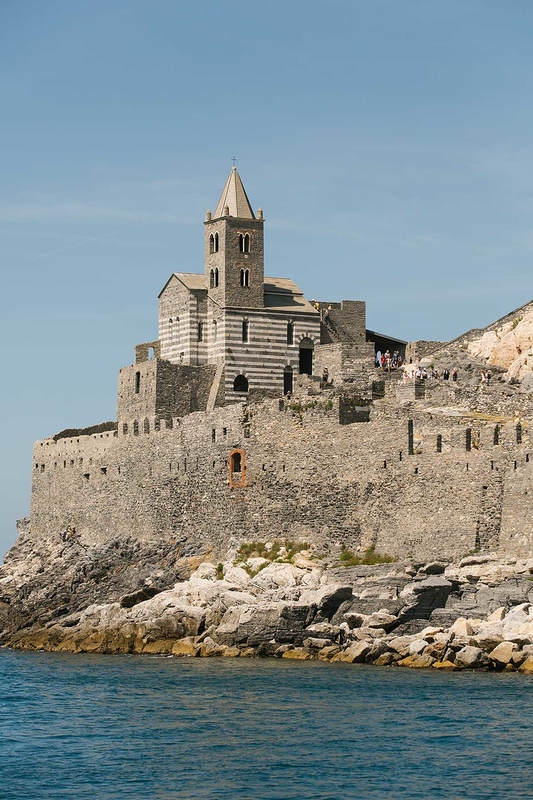 After a slow-paced 7 minute walk, we arrived to Portovenere’s church, which sits atop a beautiful cliff. Inside, black and white stone create an interesting tiled floor and exterior. 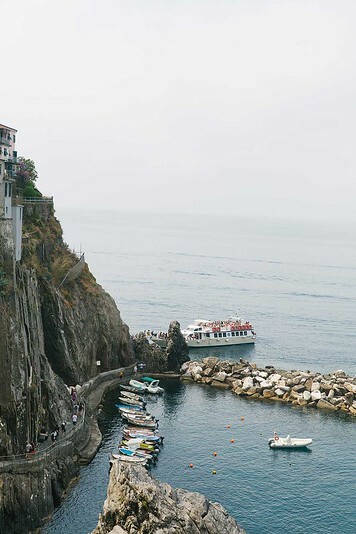 Climb the narrow staircase for a great view of the ocean and boats passing on by! And that was my trip in a nutshell! 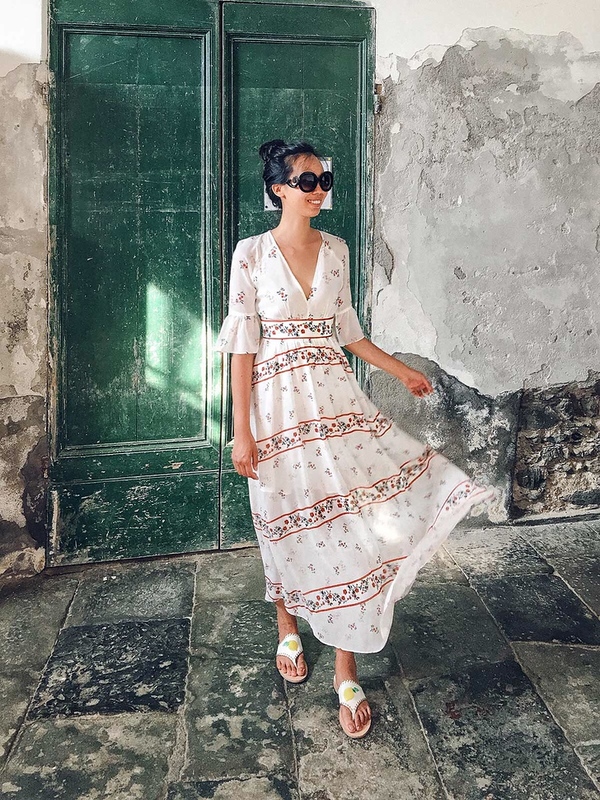 Bonjour…love, love, love your photos and write-ups…Yes, we covered all 5 towns in one day too…which was very rushed…would have preferred 2-3 days at leisure….but you did a fabulous job of sharing all the great views. So stunning! Can’t wait for the hiking post! 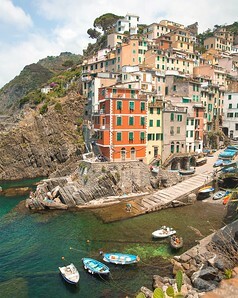 Cinque Terre is just unbelievable! Your photos are amazing. It seems to be featuring everywhere this year so I hope it doesn’t have the charm taken out of it, it’s definitely near the top of my Europe list right now! Thanks Clazz! It does seem to be all over Instagram doesnt it? I think ever since Rick Steves spilled the bag on CT, its been over run, but mostly by cruises and day trippers. If you visit, get an early start, do a siesta and then go out again in the evening :) that way you won’t really notice the crowds!